My last three games for Mr. Schiller's 5th graders have all been about decimals. They worked pretty well, and I definitely tried new things for myself as an educational game designer. The first game came when they were first digging into decimal multiplication, just doing whole number times the decimals. I went through a large number of gyrations about a good context, but I kept coming back to measurement. I thought about a race game, where students measured out multiple decimal portions of a meter or centimeter - and I still think that has some potential. If it was warm, especially, I'd love to see them out with meter sticks on a course they made around the school. Of course, we were in the midst of the harshest winter in 70 years. No one even remembered what the sidewalks looked like. I also thought about physically stacking things, but I wasn't sure about what materials we had to stack. I'd like to see more of what game designers call dexterity games in math. I finally went with burgers - I suppose with Robert Kaplinsky's In-n-Out burger activity rattling around my skull. The game itself is almost more of an activity. Some students built their burgers and didn't care about the game layer on top of that. Choosing ingredients, making the picture - that was very engaging for most of them. Who makes the best burger in town? Idea: Roll 5 dice to get ingredients for your burger. The numbers correspond to how many mm tall each part is. Three 5s means 3 all beef patties. Two 6s means two layers of bun. You get to reroll one time. Pick the dice you want to reroll. 1 – sauce, .1 cm. Choose from ketchup, mustard, mayo, hot sauce, , barbecue sauce, secret sauce. 2 – cheese, .2 cm. 5 – patty, .5 cm. 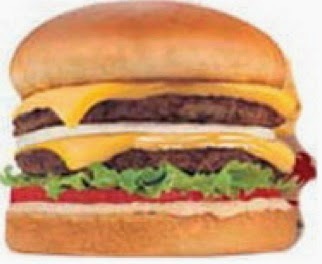 Maximum: 3 patties, UNLESS you have 3 buns, then you can have 4 patties. 6 – bun layer, .6 cm. Maximum: 3 layers. Every burger needs at least 1 layer of bun! The choice on the different rolls seemed crucial - their customization increased variety and student ownership. The rerolling mechanic is the child of Yahtzee, of course, but a great way to add choice and chance for redemption. 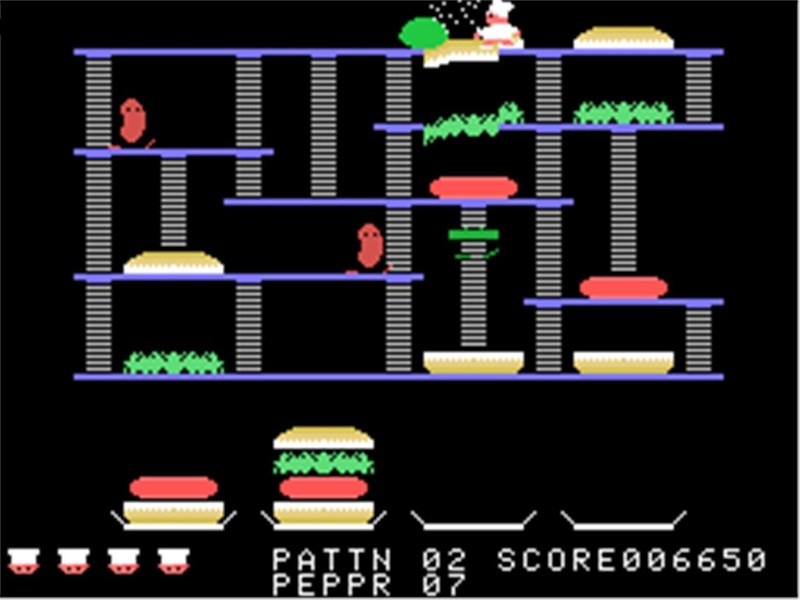 We launched the game with stories of great burgers with excessive description. 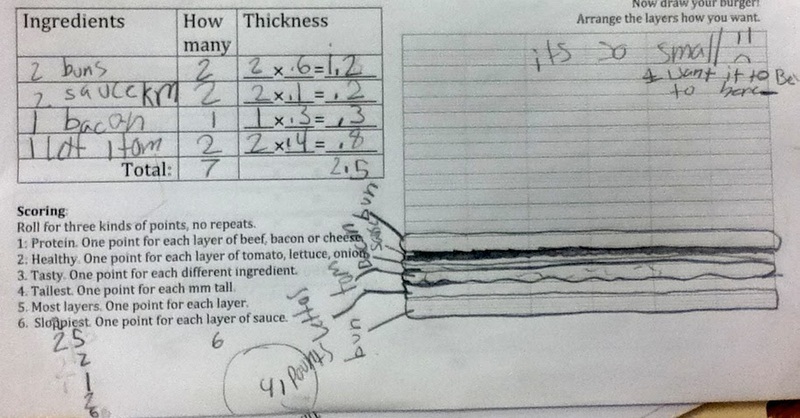 I rolled up a burger with help from the class and demonstrated the multiplication. As the students played, they ignored some of the rules - which I see as making the game their own. In the end of class discussion, that gave them plenty of fodder for suggestions for the game. Add another ingredient, let people go meatless or bunless, and - certainly - we should actually make the burgers. The game was an undeniable hit, and seemed to provide some good experience for multiplication of decimals as groups of decimal quantities. As you can see in the student work below, there was lots of material generated for discussion between student and teacher and students with each other. 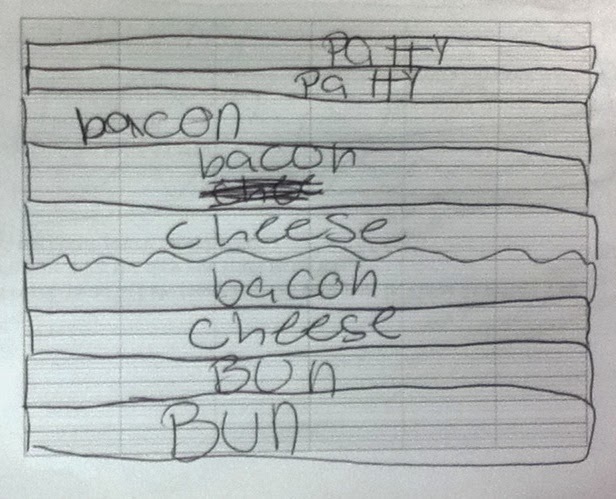 "See, it has meat instead of a bun, but still the regular meat, with the bacon and cheese in the middle." Here's the form as a pdf if you're interested. Email me for the Word doc if you want to modify. OMG! I love gaming in the classroom. I consider myself a educational game designer as well. I have to check out more of your games. Here is a link to some of the games I play in my classroom.